How can you get more sales and traffic to your Amazon listings? 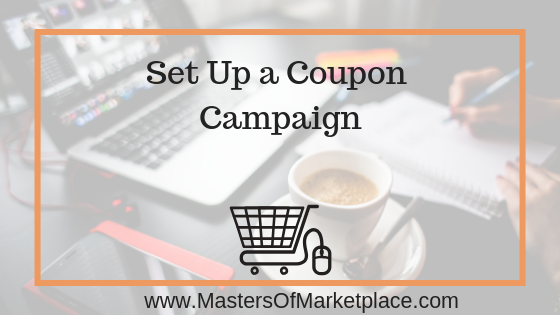 Try setting up a coupon campaign to increase your visibility and boost sales. Coupon campaigns are a great way to get more sales to your Amazon store and to get your products in front of more customers. Many people don’t know that Amazon publishes these coupons on other pages, which helps give you a lot more visibility, and we’ve seen great results when we do this. Click below to watch the video OR keep scrolling to read the same information written out for you. To set up your coupon campaign, go to your dashboard, go to Advertising, and click on Coupons. You can choose how many products you’d like included in your coupon; I’d recommend no more than 10 per coupon. Next set a discount amount, which can be a percentage or a dollar amount off of your regular price. Try a $5 or even a $2 off coupon. Start low, let it run, and see what happens! Amazon also allows you to set a campaign budget so that you are in control of the total discount amount being offered. You will also set up the amount of time your coupon will be active, and you have the ability to target certain groups like Prime members and mom’s clubs. We see a lot of really good success with doing a weekend sale, or running the coupon for 3-4 days and then deactivating it. I don’t recommend always having a sale going on because it can diminish the impact when you announce that you are offering a discount or promotion to your customers. When customers feel like they’re getting a great deal for a limited time only, they tend to get more excited and purchase more. Click here to see what Amazon’s coupon page looks like. Go run a coupon campaign today so that your products can be showcased here too! If you’d like to learn more about selling on Amazon or offering it as a service to others, you can subscribe to my YouTube channel to see the videos I post each week. I’d also love to see you in the Masters of Marketplace Member Site where we discuss all things Amazon all day long!